About one hundred Cornell graduate students gathered outside the Cornell Health Center on campus Wednesday afternoon. They were calling for an external review of the mental health services at the University. 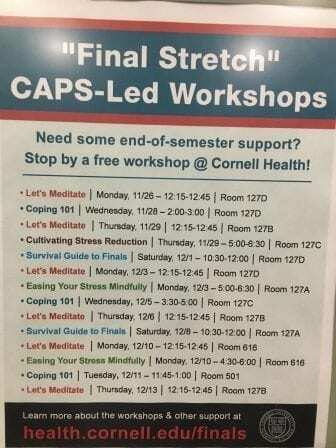 Flyer in elevator of Cornell Health with schedule of end of semester workshops sponsored by the Counseling and Psychiatric Services of Cornell Health. Students shared their own mental health struggles. They described not being taken seriously by faculty and having to go off campus to find therapists. They say getting appointments is difficult unless they are in crisis, suicidal or in academic trouble. Three years ago, Thea Kozakis, a Ph.D. student in Astrophysics had a mental and physical health crisis that caused her to take medical leave. After several speakers, the group walked to the President’s office and delivered a petition with over 800 student signatures. They were told that University President Martha Pollack was not in the country. They said they want a meeting with Pollack by February 1, 2019.